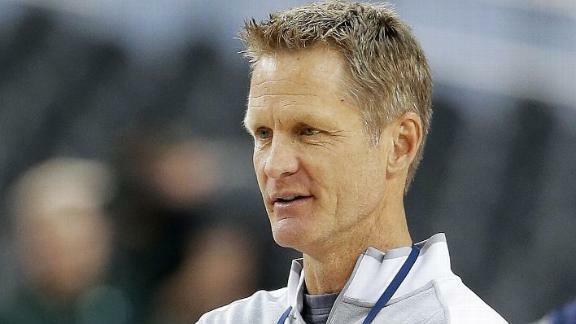 The Golden State Warriors met Tuesday with Steve Kerr before his TNT broadcast in Oklahoma City and appear to remain in the running for him alongside the New York Knicks, according to sources with knowledge of the situation. Sources told ESPN.com that the Warriors, after initially believing they had no shot at Kerr because he was "too deep" into his negotiations with the Knicks, are pressing him as hard as they can to try to change his mind after Golden State's other top coaching target -- Stan Van Gundy -- struck a deal with the Detroit Pistons. The Knicks, sources say, remain the strong favorites to land Kerr, largely because of his longstanding relationship with new team president Phil Jackson. One source close to the process told ESPN.com's Ramona Shelburne that New York and Kerr's representatives have been in "the final stages" of talks for more than a week and said he'd be "shocked" if Kerr landed anywhere but New York. But the ongoing delay in wrapping up a deal, amid repeated suggestions that the parties are struggling to find a consensus on contract terms, has emboldened the Warriors to make this renewed push. Kerr also has longstanding relationships with Golden State owner Joe Lacob, son Kirk Lacob and Warriors president Rick Welts. "Given what's happened with Van Gundy, they're going to make another run at him," one source told ESPNNewYork.com's Ian Begley before Tuesday's meeting. Kerr is not scheduled to work again until a potential Thunder-Clippers Game 7 on Sunday in Oklahoma City, giving him a window this week to choose between the offers if he wishes. The Knicks initially hoped to close a deal with Kerr after the first round of the playoffs but have been forced to relent on that timetable. The widespread belief for weeks in NBA coaching circles has been that Kerr would find it very difficult to turn down Jackson, one of his mentors, to take a coaching job elsewhere. Besides Golden State, ESPN.com reported last week that the Utah Jazz want to pursue Kerr for their opening. The Cleveland Cavaliers and new general manager David Griffin, another close Kerr associate, are also looking for a coach after Monday's dismissal of Mike Brown. Golden State, though, continues to cling to hope that it can trump Jackson's Knicks because of a roster headlined by star guard Steph Curry and the ability for Kerr to take over a 51-win team in his home state. Kerr is a Southern California native and has lived in San Diego for years. But a league source told ESPNNewYork.com's Ian O'Connor last week that Kerr's respect for Jackson, as well as the opportunity to be mentored by the coach with more championship rings (11) than any other, outweighed any perceived advantages in Golden State. "Unless something changes," said the source, "[Kerr's] relationship with Jackson is a very big part of this. And that's the way it looks like it will go." Among the candidates Golden State is expected to consider if it can't land Kerr are coaching veterans Lionel Hollins and George Karl. Despite his popularity with many players, most notably Curry, Mark Jackson was fired after the Warriors' first-round loss to the Clippers in seven games in the wake of mounting tension between him and the front office. ESPNNewYork.com's Ian Begley breaks down the Warriors' re-engaging with Steve Kerr for their head-coaching job and what it means for the Knicks.